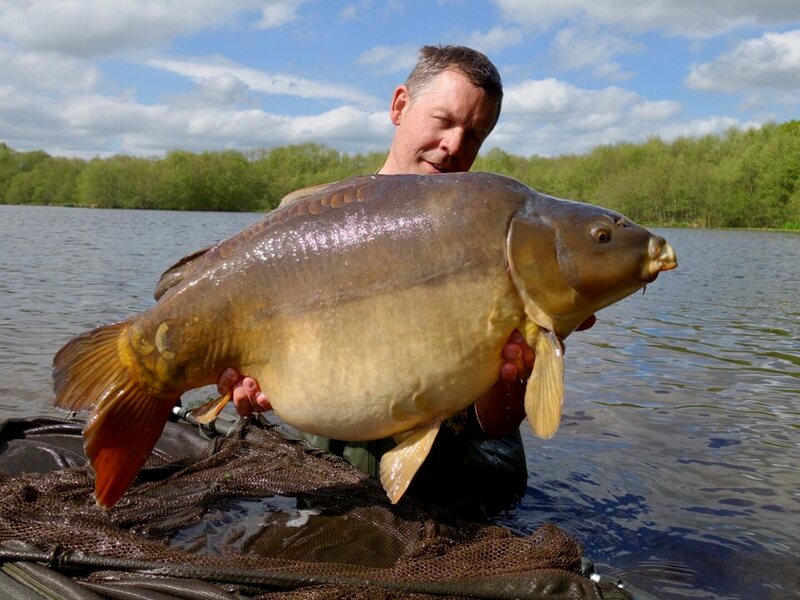 Badgers Holt – Markus had a great week landing 9 carp to upper-forties. The fish were caught from a variety of spots around the lake. All were caught on a mixture of Serreire’ fishmeal boilies fished in conjunction with pellets. Lac Serreire – Pete had a good week in the Outflow swim landing 5 fish, all of them being forties except one. Best fish was a 49lb mirror. The Middle swim produced mirrors to 45lb and over in the Woods Bob had a number of fish to 45lb. Plenty of forty plus fish making an appearance this week as we head into September. Badgers Holt – Bob had a good week landing 8 carp. The best fish being mirrors of 53lb and 52lb. All the fish were caught on Fenspice boilies fished in conjunction with 16mm Coppens Premium Select pellets. Bob caught from a variety of spots and mainly fishing over heavily baited areas. 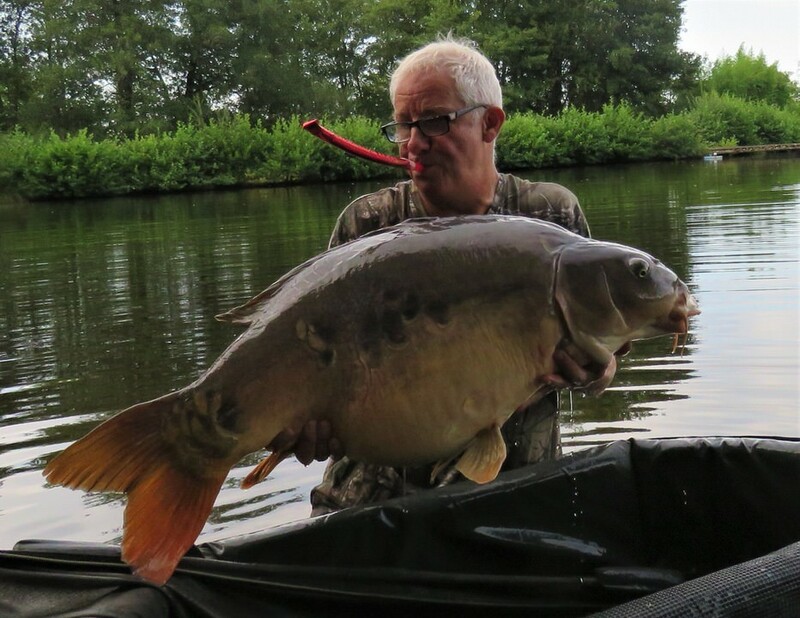 Lac Serreire – Jimmy and Danny had 12 fish to mid-forties on the left bank from the Shallows and Middle swims using the Serreire Crayfish and Squid baits. And Peter had one fish from the Woods swim using Mainline baits. Badgers Holt – Roland and Andy had a great first ever week fishing the complex, landing 9 carp. Best fish were 57lb and two 49s. The fish were from a variety of spots, mainly open water and were caught on a combination of 16mm Coppens pellets, Serreire Crayfish & Squid boilies and some home made bait. Various presentations were successful including wafters, snowmans and pop ups. The carp were incredibly active with lots of showing and fizzing, clearly in the areas with the most natural food available – eg the siltiest areas of the lake. Congrats guys on a great week and see you next year. 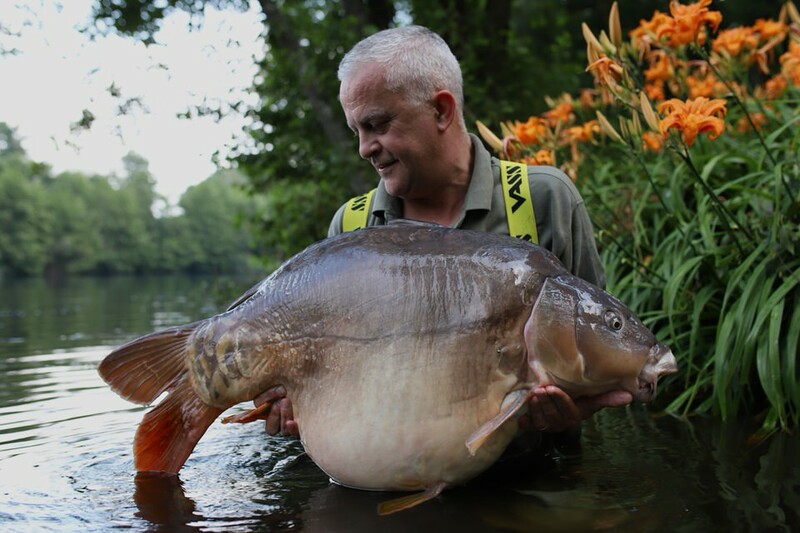 Lac Serreire – Was only fished by three anglers. About 9 fish were landed to low forties with Vernon in the Woods swim being the most successful. This week has started well on Badgers with 3 fish already – Details to follow in next week’s catch report. Badgers Holt – Sam had a great first week ever fishing the lake landing 16 carp. The best two fish were both 51lb 8oz. All were caught on the Serreire Crayfish & Squid wafters presented on long hairs over matching freebies mixed with 16mm Coppens Premium Select pellets. Most people seem to shy away from the 16mm pellets thinking they are too big. But they can be applied more like boilies with spacing between them, which gives a major advantage in terms of the way the fish feed and the chances of them making a mistake. Also, they are just different to what the carp see so regularly and this is half the battle with pressured fish. Once autumn arrives, then the lower oil 10mm Coppens Intensiv pellets will of course come back into their own. Sam fished the lake very effectively, not chasing the carp around, priming spots and fishing away from where the vast majority of anglers fish. Top angling Sam – Congrats on a great session. Lac Serreire – Manfred had a great week in Tim & Mary’s swim landing 11 carp to 60lb 4oz along with plenty of other big fish. All the fish were caught at medium range on Manfred’s own rolled fishmeal baits. After lots of discussion in the past, it’s interesting to know that Manfred’s and our bait are very similar and Manfred shares the same views on the types and ratios of fishmeals that are ultra effective in a bait. These baits, like the Serreire Crayfish & Squid baits, are totally different to 90% of commercial baits on the market. Over in the Woods swim Georg had four fish to 42lb and in the Middle swim, Mick had two fish to 43lb all fishing on their own baits. In the Shallows swim Volker had nine fish to 46lb on a mixture of the Serreire Crayfish & Squid baits and Nutrabaits. As always, August proving to be a time of the year when the fish are feeding at their heaviest with great results possible as long as the bait and bait application is able to compete with the naturals. 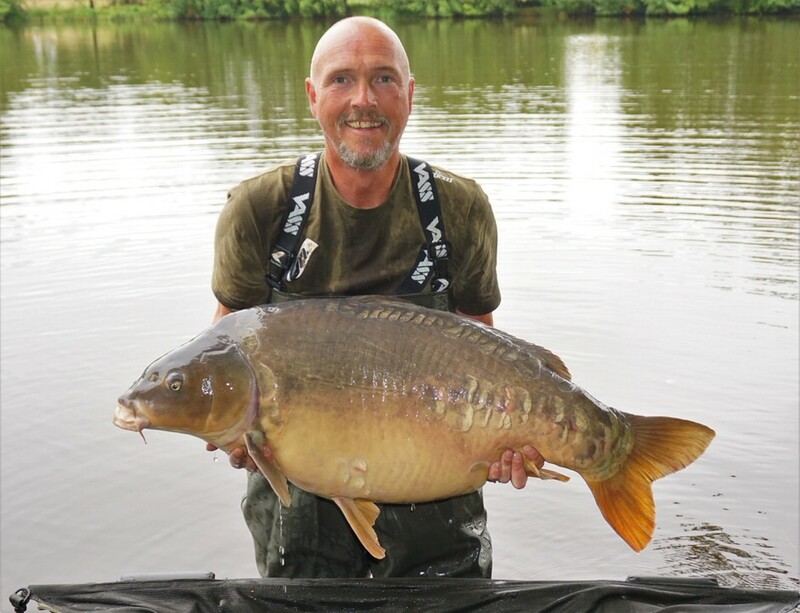 Badgers Holt – Mike fished the lake for the first time and, despite one of the hottest weeks on record here, with temperatures touching 40C, had a good result hooking six carp and landing five. Best fish was a 43lb 10oz mirror. Despite the fish showing themselves a great deal all over the lake, Mike resisted the temptation to chase them around, baited some spots and stuck to them. Rigs were left in place for 24 hours at a time and, as usual, this proved to be a pretty effective way to fish the lake. All fish were caught on the Serreire Crayfish & Squid wafters presented over matching freebies mixed with 16mm Coppens pellets. The larger pellets offer longer breakdown times in the warm water conditions at this time of year and often prove much more effective than the smaller pellets favoured by many anglers. Rigs were super simple, the key point being that the hairs were longer than most anglers feel confident to use. Congrats Mike, a great first week on Badgers. 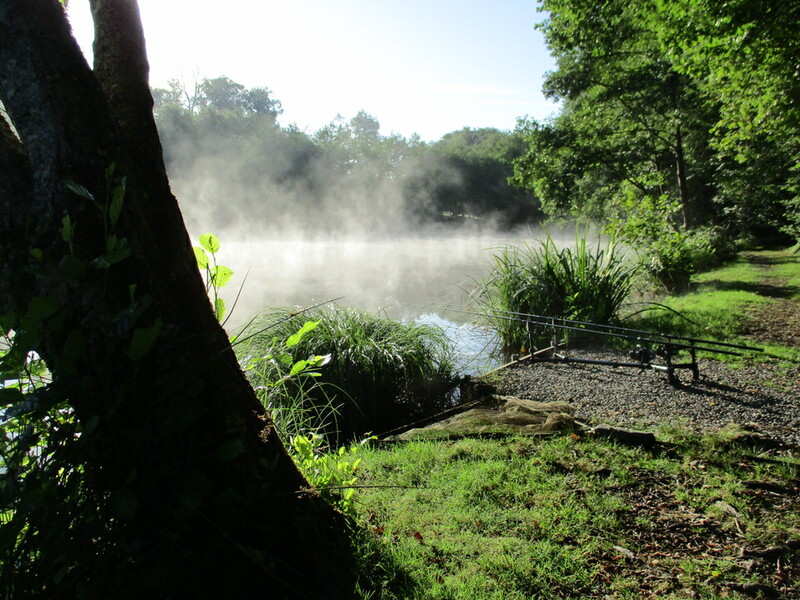 Lac Serreire – Was not fished all week due to car problems for the group booked on. I fished it for a couple of hours on Friday evening as it got dark and landed four carp to mid-forties from Tim & Mary’s swim casting to fizzing just 60yds or so out. 18mm Serreire Crayfish & Squid baits fished on extremely long hairs did the trick. As always, for this type of fishing, I just fished a single rod, more rods would simply cut the chances down. It’s also interesting to see that many fish are active in this swim at close range these days because nobody ever fishes there. The carp soon learn the safe areas and this has become one of them. At this time of year, the signs are often so subtle with just tiny patches of fizzing, often the only thing that gives them away. This week has started well for Sam on Badgers Holt with a fish in the early hours. Badgers Holt – David and Mitch had a great first week ever on Badgers Holt landing a 61lb PB mirror along with a 48lb mirror and a common of 30lb. The fish were caught on a combination the The Bait Room’s pop ups and the Serreire Crayfish & Squid wafters fished over matching freebies. 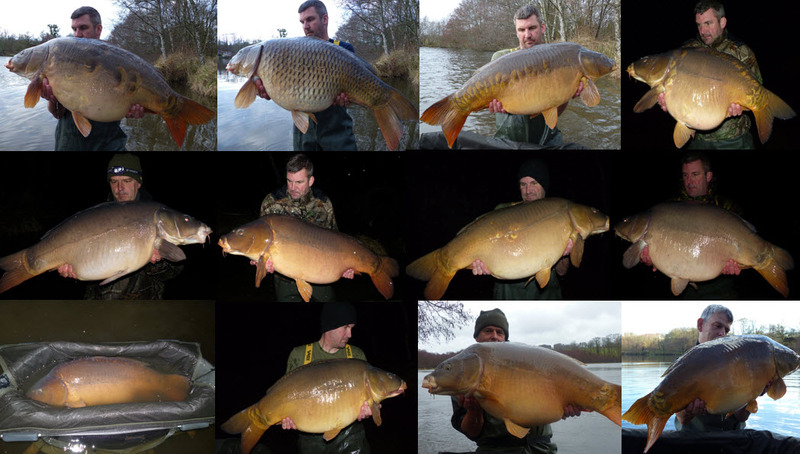 This was the third consecutive week with 60lb+ fish from Badgers. A great first trip to the complex and congrats on the PB!! 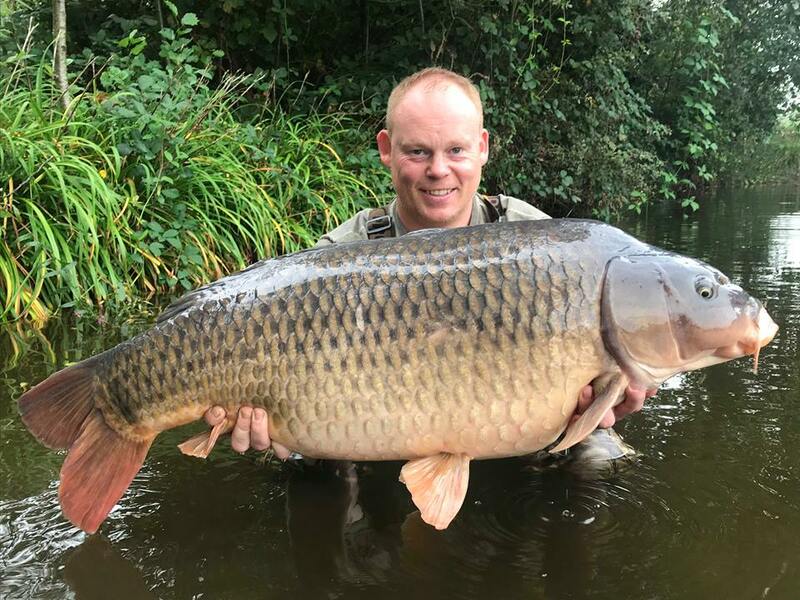 Lac Serreire – Paul and Tony had an eventful first visit to the complex landing seven carp from the Woods swim up until Wednesday and then unfortunately being forced to pack up mid-week due to a storm. Badgers Holt week 1 – Spencer and Ben had a great week landing 12 carp including a new PB for Spencer with a 61lb 6oz mirror which was also another new 60 for the complex. Best fish were 60lb, 57lb, 56lb, 50lb & 50lb. With one sixty and four fifties it was certainly a memorable week. The fish were caught on pop ups fishing a variety of spots. 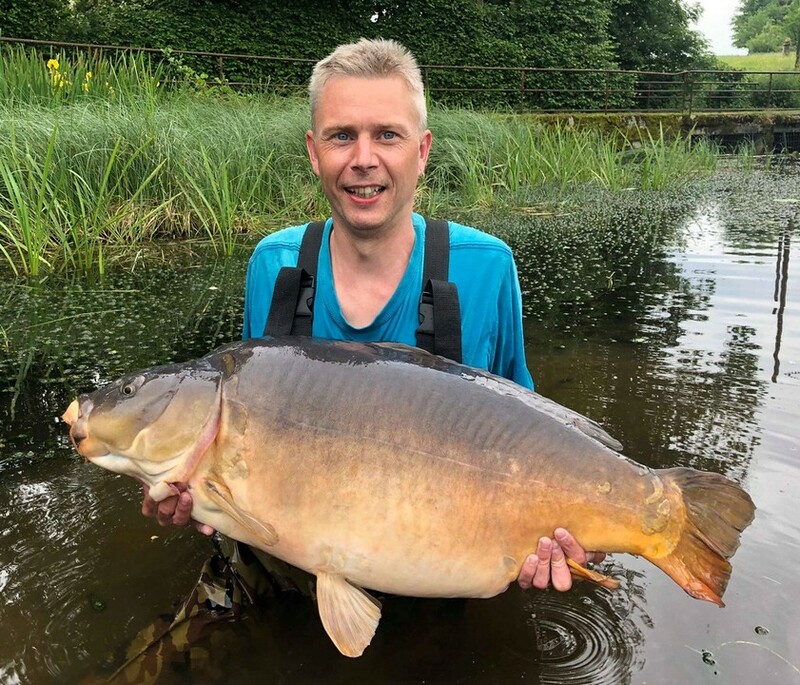 Badgers Holt week 2 – Steve also had a memorable session, also beating his PB, with yet another new sixty for the complex with a mirror of 60lb 7oz, his first fish of the week caught on Sunday. This was followed up with fish of 51lb and 50lb along with three big forties and a twenty. All the fish were caught on the Serreire Crayfish & Squid baits fished in conjunction with Coppens pellets. Congrats on the PB!! Lac Serreire week 1 – James, Lee and Warren had a good first ever session on the complex landing 16 fish to 62lb. A variety of swims were fished with the fishing showing being very active and mobile. Lac Serreire week 2 – Graham landed 5 fish in the Shallows swim, Jason had 1 in the Middle swim and Richard had 1 in the Woods. Best fish was a 44lb mirror. All were using Blakes baits boilies. 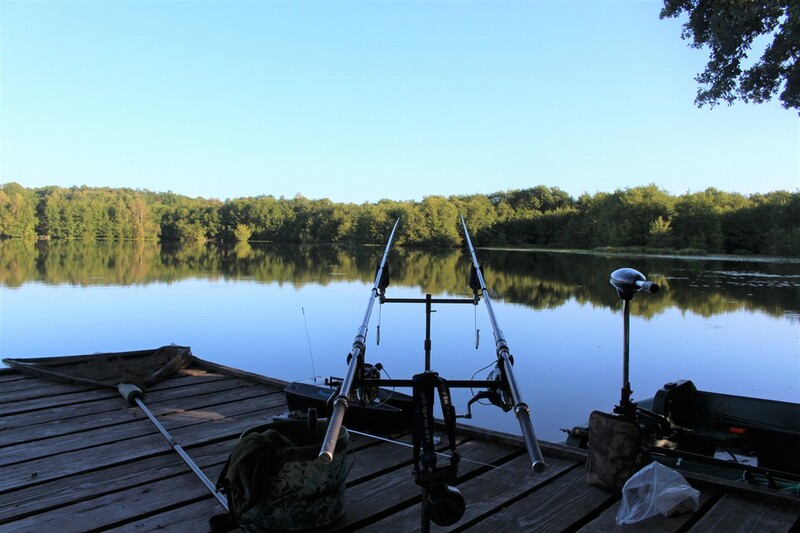 Lac Serreire – Bob had a great first ever session on Serreire landing 26 carp from the Middle swim. Best first were mirrors of 62lb and 58lb (congrats on the PBs). All the fist were caught by casting at around 90yds without any use of boats. Bob used his own fishmeal baits. Ben started in the Shallows swim, landed 2 carp there, and then moved to the Woods swim to go on to catch 14 more there to 48lb. Again, all fish were caught by casting, at relatively close range compared to the way that many people fish this swim. In the Island swim Stuart and Tanya had 6 fish to 39lb using the Serreire Crayfish & Squid baits. Badgers Holt – Nathan had a good first week on the lake catching 5 carp to 55lb (another PB – Congrats!!). All the first were caught on short hook links, long hairs and by casting. Successful bait was the Serreire Crayfish & Squid boilies, Coppens pellets and matching wafters as hook baits. Lac Serreire – 26th May: Gavin had a fantastic week fishing the Middle swim and beating his PB twice. His best fish were mirrors of 61lb and 48lb, along with a common of 43lb, and a lot of other good fish making a total of 16 carp for the week. In the Shallows, Ian had 6 fish to 42lb and over in the Outflow, Reg had fish to 44lb fishing at close range. In the Woods swim Geoff and Gary had 22 fish to 47lb with 7 of them coming from the left side of the swim. This side is often not fished, but nearly always has plenty of catchable fish within range and often some of the bigger fish show up from this area. Most of the fish were caught on the Serreire Crayfish & Squid boilies. Lac Serreire – 2nd June: Eddie in Tim & Mary’s had 4 fish to 42lb and Adam in the Island swim had 4 fish to 45lb. Over in the Woods swim Tom & Gary had 7 fish to 41lb. And in the Shallows Snowy had a big hit with 19 fish to mid-40s. All fish were caught on the Serreire Crayfish & Squid baits or similar baits supplied directly from Geoff Bowers in the UK. All used Coppens pellets. Badgers Holt – 26th May: Dan had a good first session on the lake landing 4 carp with the best two both being 49lb. Badgers Holt – 2nd June: Alan and Adam had a good week landing 5 carp. 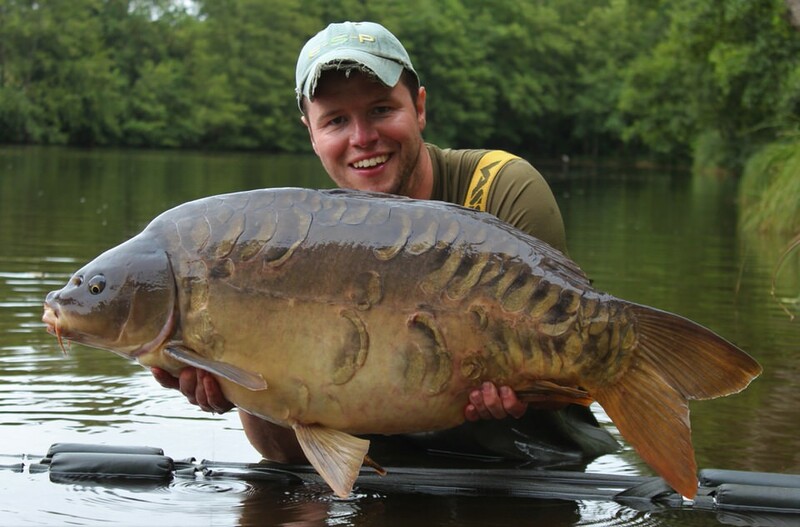 Adam had the biggest fish with a PB mirror of 57lb. Successful baits were a combination of the Serreire Crayfish & Squid, a very similar fishmeal from Geoff and a lot of Coppens pellets. 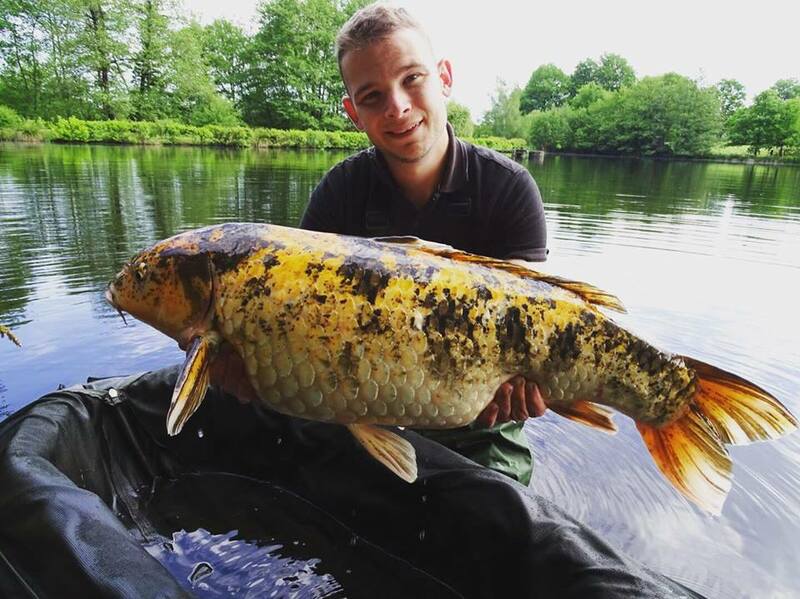 Badgers Holt – Douwe and No Henstra had a great week landing 13 carp to 50lb. Amazingly they also managed to catch three of the elusive koi carp during the week. These fish are so rarely caught, but this year have made much more of an appearance. They are some angler’s target fish and absolutely stunning creatures. Congratulations!! 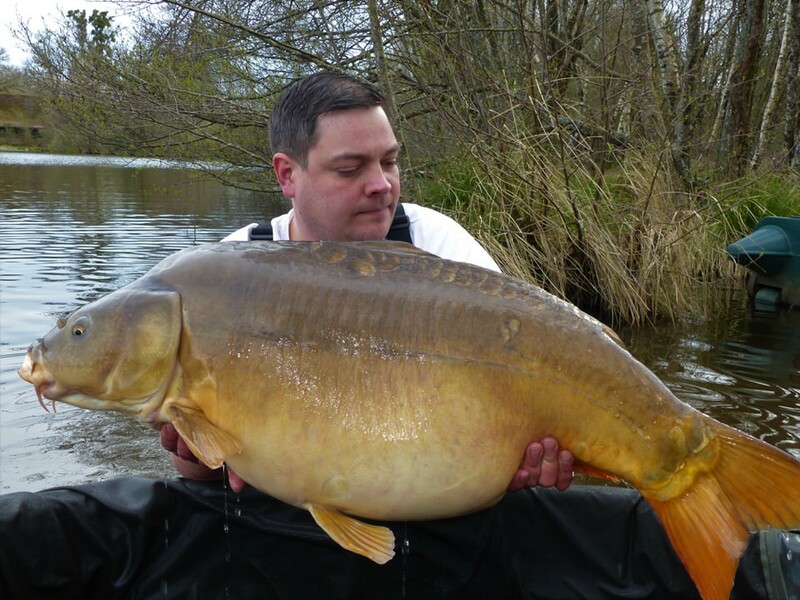 Lac Serreire – Rob had 6 fish in the Shallows swim including a 47lb 8oz. common. And over in the Woods, Cliffe had 7 fish to 46lb before moving to the Outflow and having two more to 47lb 8oz. We would like to remind all anglers that it is essential that you bring scales that read to at least 85lb otherwise you will not be able to fish. Please also do not arrive before 1pm on the arrival Saturday. And please note that, as stated in our fishery rules, only the pellets sold on site can be used. Alternatively Coppens Intensiv or Premium Select pellets can be brought on to site. No others are permitted. Finally, we do not accept excessive drinking on the fishery; water, boats and big carp are not a good mix with alcohol. Note that this is not aimed at any of the anglers who fished last week. Badgers Holt – Keith and Chris also had an excellent week landing 17 carp. Best fish were 59lb, 55lb & 51lb. They also landed 3 koi carp of 12lb, 23lb and 26lb. A couple of these koi’s almost never come out, so this was a real result. The white koi is particularly elusive and rarely even seen, let alone caught. Successful method was heavy baiting with 10mm Coppens pellets and Mainline Link boilies combined with a few Serreire Fenspice baits. Congrats on a really good week! Badgers Holt – Paul had a great week landing 10 fish including 2 x 50s, 4 x 40s and 4 x 30s. The biggest two fish were mirrors of 55lb 2oz and 53lb 12oz. Interestingly Paul caught the orange, black & white koi at 31lb 12, maybe it’s best weight ever and a beautiful fish. All the fish were caught on the Serreire Crayfish & Squid baits fished in conjunction with mixed Coppens pellets and a Mainline Hybrid baits. Hook baits were the Crayfish wafters. 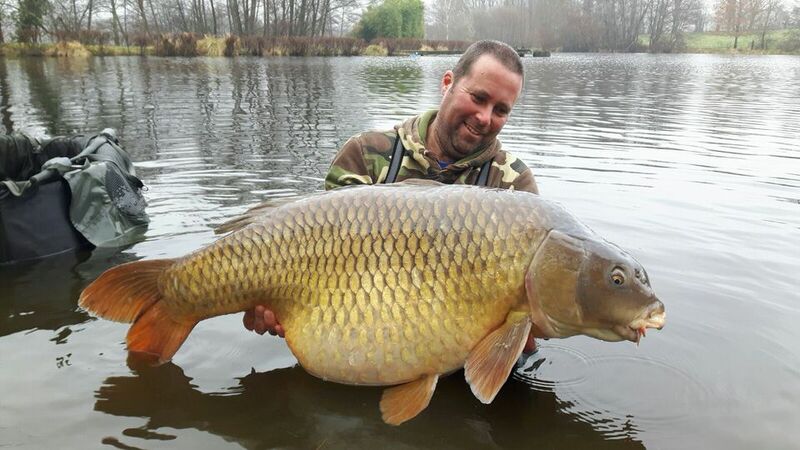 Lac Serreire – The carp spawned at the start of the week. But, despite the spawning, Volker landed 8 fish to 42lb 4oz fishing the Island swim. Over in the Woods swim Stuart had 9 fish to 30s. In the Outlet swim Rob had 2 fish to 41lb 8oz. In the Shallows Darren had 13 fish to 42lb 5oz. The fish were caught on a mixture of the Serriere Crayfish & Squid baits and the angler’s own baits. This week has started well with two fish from Badgers Holt last night including the rarely caught white koi. 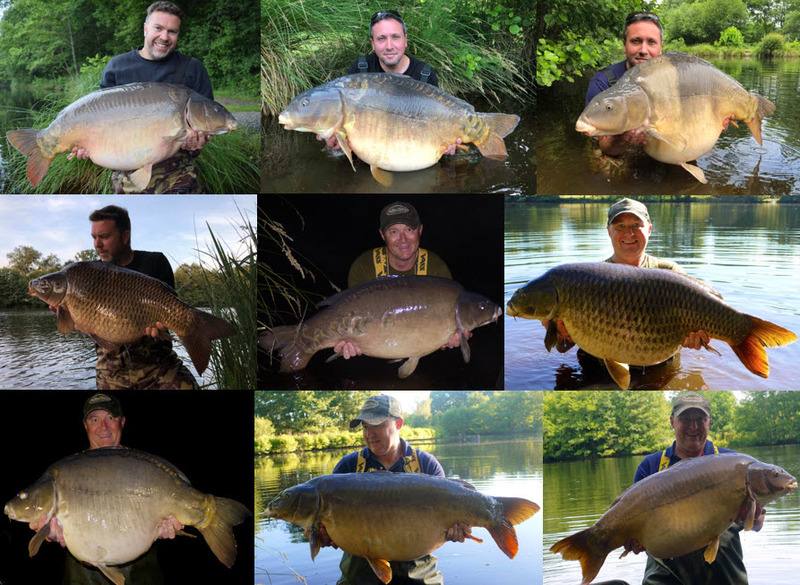 Lac Serreire – Great week with 57 carp in total caught. Jeff moved around and fished both Tim & Mary’s and the Shallows for 11 fish with the best fish being 63lb 8oz. Dean fished the Outflow swim for 11 fish including a 58lb 8oz mirror and a 50lb 4oz common. Over in the Woods swim Derry had 7 fish to 54lb, a PB. Pete had 19 fish from the Shallows swim including 5 x 40s to 48lb. And Merv had 9 fish from the Middle swim including mirrors of 49lb 12oz and 49lb 4oz. The fish were caught on a variety of baits including the Serreire Crayfish & Squid boilies along with the group’s own baits. Badgers Holt – Mike had a 38lb mirror but unfortunately had to leave early and cut the session short. Badgers Holt – Thomas fished until Friday morning before having to leave. Simon joined him for a couple of nights early in the week. It turned out to be the session of a lifetime with numerous big carp landed. On Wednesday alone, Thomas landed five 50s and his second 60 of the week, all in one day. The 60 was another new 60 for the complex. Best fish of the week were 60lb, 60lb, 58lb, 56lb, 52lb 51lb, 51lb, 50lb, 50lb, 49lb, 49lb & 49lb. All fish were caught on single Serreire Crayfish & Squid wafters as hook baits presented over heavily baited areas of matching boilies along with Coppens pellets. Rigs were short hook links, 60mm (separation) hairs, MCF clips, light DSG leads and size 6 Wide Gape barbless hooks fished with lines very slack and no back-leads. Mainline was Touchdown in 20lb BS. Great angling Thomas! Lac Serreire – Richard & Matt had a good week in the Woods swim landing 12 fish including two 47s, one common and one mirror. Charles had 3 fish in the Island swim. Over on the Outflow swim, Chris had 7 fish including four 40s to 48lb. Kevin had 6 fish in the Middle swim to 46lb and Peter had 19 fish in the shallows to 61lb 11oz, a new PB. Congratulations on the PB Pete!! Successful baits were a combination of Mainline Essential Cell in conjunction with Serreire Crayfish & Squid boilies and Coppens pellets. Pellets were mixed 10mm and 16mm sizes. All in all 47 fish were landed which was a great result for the group’s first visit to the complex. Lac Serreire – A fantastic couple of week’s fishing. Thomas Kamin landed 30 carp from the Shallows swim including numerous 50s and 40s. Best fish were mirrors of 53lb 8oz and 53lb 6oz. All the fish were caught on the Serreire Crayfish & Squid boilies fished in conjunction with 10mm Coppens pellets. Short hook links and 60mm hairs proved to be as deadly as always. 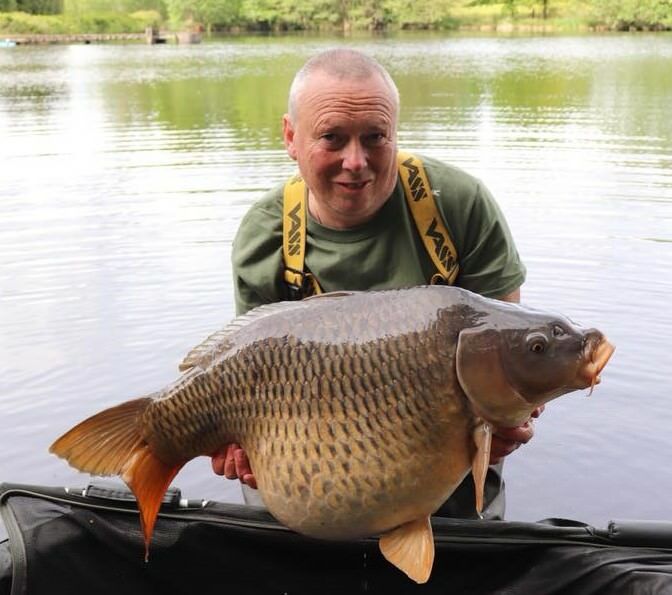 In the Woods swim Graham had fish to 42lb (a stunning PB common) using the same baiting approach. Last week, Mitch and Andy fished the Middle and Shallows on the left bank and landed 32 fish. This was a great example of how to fish these swims with only one lost fish (hook-pull around the Shallows swim pole) out of 33 fish hooked. Andy used DNA baits and Mitch used the Serreire Crayfish & Squid baits combined with a lot of Coppens pellets.. Regular baiting kept the fish in the area. James in the Woods swim had a nice first visit to the complex landing fish into the thirties. Badgers Holt – Wim and his father had a great two weeks landing 9 carp. The last 3 fish were 56lb, 56lb and 55lb so they finished on a high. Most of the fish were caught using Coppens pellets. This week has started well on both lakes with plenty of fish out of both. Details will follow in the catch report soon. that the carp really love and applying it perfectly for the conditions. Top angling Amanda and Mike! See you next time. 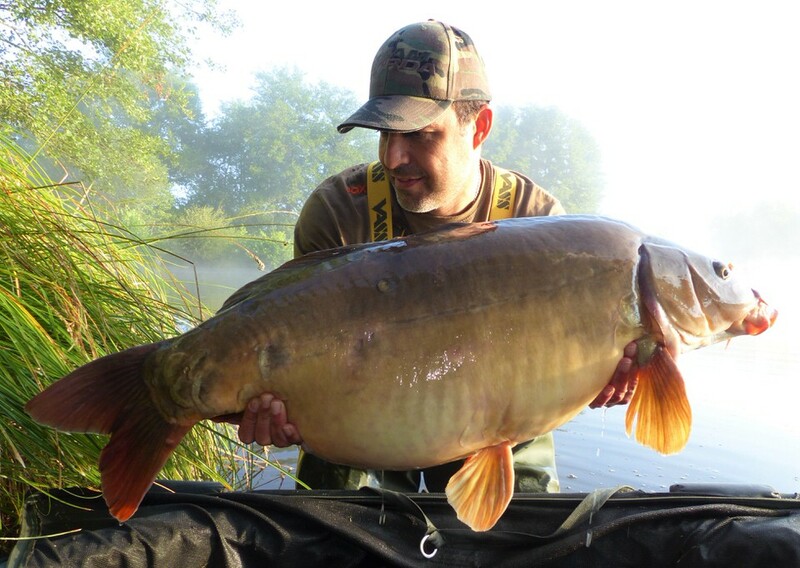 Lac Serreire – Dan in the Shallows had 7 carp to 46lb, Andy in the Woods had 4 fish also to 46lb. Nigel had a nice mid-30 common from the Outflow swim. The fish were caught on a mixture of baits and methods. Photos will follow. Badgers Holt – Martin and Marco had a great opening week to the season landing 15 carp including 7 x 50s and 1 x 60. Best fish were: 65lb, 55lb, 55lb, 55lb, 55lb, 54lb, 54lb & 50lb. They also had a couple of high 40s amongst the others. All the fish were caught on the Serreire Crayfish & Squid boilies fished in conjunction with 10mm Coppens Intensiv pellets. Hook baits were the ever reliable matching wafters. The fish were caught from a variety of spots with shows being extremely subtle and just the odd bit of fizzing here and there. Congratulations guys – Great session! Lac Serreire – The lads landed 12 fish. Pat had a great week in the Shallows swim with 8 of the 12 fish coming to his rods. Best fish being mirrors of 55lb and 54lb and a common of 53lb. All of Pats fish came to the Serreire Crayfish & Squid boilies fished at range. The rest of the group landed one fish from the Island swim and 3 fish to low 40s from the Woods swim using a variety of other baits and tactics. 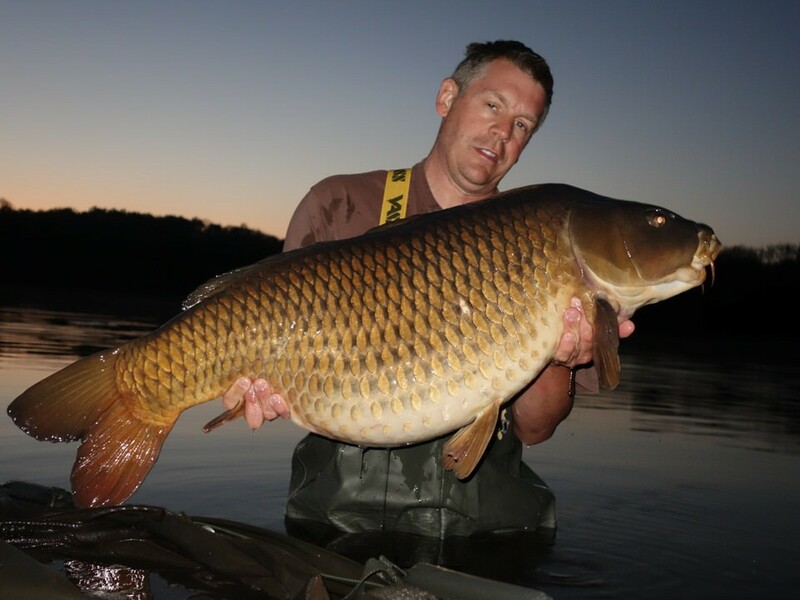 Badgers Holt has started well this week with a 39lb common already out last night. More to follow I’m sure.